Crestpoint Real Estate Investments Ltd. and its investment partners have been busy thus far in 2018, acquiring office and industrial properties worth more than $600 million in three major Canadian cities. The acquisitions in Greater Vancouver, Montreal and Toronto bring Crestpoint’s total gross asset value to approximately $3.5 billion and approximately 20 million square feet of office, industrial and retail space. “Our team is constantly on the lookout for good investments and we pride ourselves on being opportunistic,” said Crestpoint president Kevin Leon. “In the case of these transactions, our hard work and persistence paid off, as we have been working on these deals since early Q4 in 2017. The Crestpoint Core Plus Strategy Fund, established in 2011, is designed to deliver stable income and attractive long-term returns through its diversified portfolio of office, retail and industrial properties. It contains both core and value-add investments. “The assets should all provide solid current income with future upside to increase income either though increasing existing rents that are currently below market or through exploiting potential redevelopment opportunities,” Leon said of the new acquisitions. Crestpoint acquired 12 office and industrial buildings in Greater Vancouver in partnership with PSP Investments. 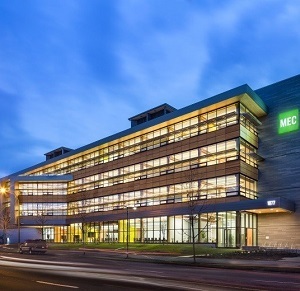 Included in the portfolio is the LEED Platinum-certified head office of Mountain Equipment Co-op (MEC) in False Creek Flats, and more than 600,000 square feet of office and industrial space in Burnaby. The portfolio, which Leon said was purchased from a “very reputable Canadian institution,” collectively comprises close to one million square feet and cost more than $300 million. SDM Management Properties LLC will be property managing the Burnaby component of the portfolio. “The MEC building is a state-of-the-art building, so the majority of our capital will be spent on upgrading the Burnaby portfolio,” said Leon. “This will include improvements to the base building systems and cosmetic work in the lobbies and show suites. Crestpoint purchased a new 300,814-square-foot, LEED Silver-certified research and design centre in a technology park near Pierre Elliott Trudeau International Airport in Montreal’s West Island. The building, formerly owned by Broccolini, is fully leased to ABB Group. Crestpoint also acquired a 50 per cent share of the 248,284-square-foot LEED-certified Broccolini Corporate Centre. The Canadian head office of international pharmaceutical company Merck occupies two-thirds of the six-storey structure. Broccolini, the centre’s developer, is its second-largest tenant and property manager. It’s keeping a 50 per cent share in the building. The two Montreal buildings were purchased for approximately $140 million on an equivalent 100 per cent basis. “Both buildings are relatively new, modern facilities. However, we have the ability to expand both assets if the tenant demand is there for additional space,” said Leon. Crestpoint partnered with Crown Realty Partners to purchase Dundas-Edward Centre from Northwest Health Care Real Estate Investment Trust for $167 million (see related story, Crown, Crestpoint acquire entire block with Toronto DEC purchase). The property includes a 26-storey office tower and a 15-storey office building that total 416,603 square feet, as well as a 303-stall, eight-storey parking garage, on a 1.1-acre full city block in downtown Toronto. Leon said the purchase price was well below replacement cost. Dundas-Edward Centre will be property managed by Crown, which is also a partner with Crestpoint in Allstate Corporate Centre in Markham. Leon said Crown has a strong track record of managing similar buildings and has experience leasing buildings in the area. “We will be spending considerable capital in the Dundas-Edward buildings to upgrade the infrastructure as well as undertake some cosmetic upgrades, particularly in 180 Dundas Street,” said Leon. Leon said Crestpoint likes ownership partnerships because “when done effectively, partnerships allow you to access opportunities that otherwise may not be available, allow you to diversify your risk and deploy your capital more strategically, while also giving you access to a broader range of resources and expanding your intellectual capacity. Between committed discretionary capital and well-capitalized investor partners, Leon said Crestpoint is “very well funded and positioned for future growth” but will maintain a disciplined approach when seeking new investments. “For the most part, we like the underlying fundamentals of the major Canadian markets and believe there will be additional opportunities over the course of the year which will ultimately allow us to generate appropriate risk-adjusted returns for our investors,” said Leon. Crestpoint is part of Connor, Clark & Lunn Financial Group, a multi-boutique asset management company that provides investment management products and services to institutional, high net-worth and retail clients. It has offices across Canada and in Chicago, New York and London. The company and its affiliates were collectively responsible for managing more than $74 billion in assets at the end of 2017.